But if you’ve ever made wire wrapped rings, you can figure this out. This is a Make Your Own Ring Kit. I’ve made a change or two to Kerry’s idea. 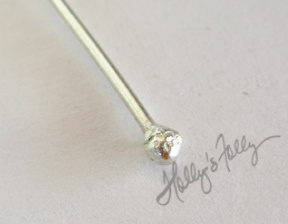 I used sterling because, it’s a harder wire and because I find it stays clean and shiny longer. I start out with 7.5″ of 20 gauge sterling. I melt a ball on one end and add a small Bali silver finding and one of my art glass beads. I protect the bead from the heat of the flame and ball the other end. I polish the wires to make them shine. The bead may still slide off the end without the Bali silver but will slide right back on… this won’t matter once you make your ring. 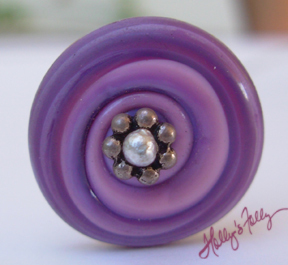 The purple bead is 4 mm hole to hole x 14 mm wide. Simply use a ring mandrel to make the ring to your size. $13.00 Or I will make it for you for an additional $6.00. And be sure to check out Kerry’s fabulous book!